Holidays are approaching and we, the Provide Support team, started thinking what treat we could give to you, our blog readers. In our sincere appreciation of your readership, we would like to offer you a selection of our best articles for managing your live chat support. Over the last few years we have covered a wide range of topics related to live support, from hiring the most talented agents, training them, selecting the best tools and maximizing efficiency. We crafted these articles based on our own experience offering customer service via live chat, putting in our love and attention to detail. We hope you will enjoy this selection and find some useful ideas and tips which you can incorporate in your best practices. We received a lot of feedback on this post. It has been our most read article since 2013 when it was first published. The readers who are just starting their careers in customer service usually find it most helpful. So if you have new CSRs to train, this post could be another useful resource for you. I still remember the fun we had collectively putting together these greetings and going over the past customer cases. Approaching the holiday season, this post will help you, your team and your customers to get into the right mood. It happens a lot in customer service when we send the customer the wrong signal though a careless selection of words. What to say, it happens a lot in personal interactions also! It is important to watch your language to ensure that you say what you mean and the conversation is pleasant for both parties. This post will help you to weed out from your dictionary some words and phrases which can give the customer the wrong impression about your company. The art of asking questions correctly is an essential skill for a customer service rep, as it allows to shorten the interactions while making them more efficient. This post will give you a few guidelines on how to master the art of asking the right questions and polish up your communications. This article will be helpful only to those of you who are a customer of Provide Support. We are sharing the tricks used by our own support agents. We thought that you, our customers, might not have figured them yet. If you are not a customer of Provide Support just yet , please check us out. Our operator console application is amazing, as our customers say. Canned replies are a big turn off for most customers. Still, sometimes it is not possible to get by without them to remain efficient. This post will help you to find the right balance and sound human even when you have use a canned message to reply to the customer. In this post my colleague is suggesting 10 rituals to develop in your workplace to make yourself happy and efficient. I find it so zen and soothing. Just don’t let your reps fall asleep in their meditation! Every department in a company depends on people and how well they do their job. It is even more so in customer service. Can there be more? This article covers the important aspects of hiring the new agents and what skills you should look for in order to find the best people. A lot of companies, especially start-ups, use live chat to add credibility to their website. This is a fair move, as offering real-time customer service can make or break your business, depending on how you approach live support. The following article shares a few tips on how to make sure you use live chat right and gain more trust from your clients and website visitors. FCR is an important metric for customer service success. To resolve customer’s inquiries at the first interaction makes the user happy and lowers the cost of support for the company. It is essential to dedicate some time to reviewing your best practices to make sure the agents are doing their best. Taking a look at live support from the customer’s perspective is the fastest way to understand what else may be missing in your workflow. This post will give you some stats facts on what customers want from your support team in the first place. If you are still considering adding live support to your website, this article will be helpful to you in conducting your interviews with potential providers. After all, you don’t want to buy a cat in a sack and waste your time on switching vendors multiple times. In this article we are showcasing the 3 tools which can help you make your live support more efficient and used more frequently by customers. From our experience we found that some of our clients don’t use these tools, by which they reduce the benefits they can receive from live chat. We hope you will not repeat the same mistakes! This is a handy infographic, by which we are trying to convince you to use the real-time visitor monitoring feature in your live chat support. It gives a lot of benefits to the support agents, allowing them to offer more efficient help to customers. This post is meant to remove your doubts whether your website actually needs to have live chat or not. There are surefire signs that you just need to get it! If you spot at least few of those signs, consider the article #12 about selecting a chat vendor. 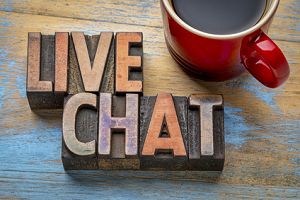 Finally, if you are a user of live chat, this article offers just 8 short tips on how to optimize your live chat best practices to make the tool more efficient and get the maximum benefits from it. Enjoy the list and make use of it! This entry was posted in Articles, Best Practice, Tips and Tricks and tagged best articles on live chat, best articles on live support, live chat best practices, Live Chat support, live chat tips and tricks. Bookmark the permalink.